Re: Is our Moon getting SMALLER? Why am I so skeptical of these conclusions? No actual measurements have been made. It seems to be based on some assumptions concerning the age of the Moon, its' history, and formation of the lobate scarps. I think I'll wait and see what develops from this. if the moon was infact shrinking wouldn't we perceive that as moving away from our planet when it's central focus could remain a constant distance during this process? flyingcloud wrote: if the moon was infact shrinking wouldn't we perceive that as moving away from our planet when it's central focus could remain a constant distance during this process? The moon has been measured to be falling away from the Earth at the rate of 3.8 cm per year in defiance of gravitation. However, the moon is not getting smaller, it is growing. And this has been known since antiquity. Scientists have discovered a new type of solar wind interaction with airless bodies in our solar system. Magnetized regions called magnetic anomalies, mostly on the far side of the Moon, were found to strongly deflect the solar wind, shielding the Moon's surface. This will help understand the solar wind behavior near the lunar surface and how water may be generated in its upper layer. Observational evidence for these findings will be presented by Dr. Yoshifumi Futaana and Dr. Martin Wieser at the European Planetary Science Congress in Rome, on Friday 24th September. Atmosphere-less bodies interact with the solar wind quite differently than the Earth. Their surfaces are exposed without any shielding by a dense atmosphere or magnetosphere. This causes them to be heavily weathered by meteoroids or the solar wind, forming a very rough and chaotic surface called regolith. Previously, the solar wind was thought to be completely absorbed by the regolith. However, recent explorations of the Earth's moon by the Chang'E-1, Kaguya and Chandrayaan-1 spacecrafts have revealed that this interaction is not that simple. A significant flux of high energy particles was found to originate from the lunar surface, most probably due to the solar wind directly reflected off the Moon's regolith. "These results may change dramatically the way we understood the solar wind-regolith interaction so far," says Dr. Futaana of the Swedish Institute of Space Physics. "Since the solar wind is one potential source of water on the Moon, we need to make better models of the lunar hydrogen circulation in order to understand how water molecules form in its upper layers. Also, it will be possible to remotely investigate the solar wind-surface interaction on other airless bodies, such as Mercury or the Martian moon Phobos, by imaging the energetic hydrogen atoms that are reflected back to space when the solar wind hits their surface," he adds. The current investigation was carried out with the Sub-keV Atom Reflecting Analyzer instrument which was developed in a collaboration between Sweden, India, Switzerland and Japan and flown onboard the Indian Chandrayaan-1 spacecraft. 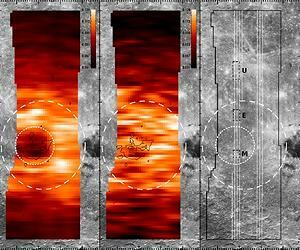 Scientists have mapped for the first time the energetic hydrogen atoms coming from the Moon, and found that up to one fifth of the solar wind protons reaching the lunar surface are reflected back to space. This may be a general feature of the atmosphere-less bodies, such as Mercury, meteorites and several moons of the giant planets. "In fact, during the close encounter of the European Mars Express spacecraft with Phobos in 2008, we detected signatures of reflected solar wind protons also from the surface of the Martian moon Phobos," says Dr. Futaana. However, when Chandrayaan-1 flew over a magnetic anomaly on the lunar surface, the scientists detected significantly less reflected hydrogen atoms, meaning that the solar wind had not reached the lunar surface. In fact, the solar wind was found to be strongly deflected by an aggregation of magnetic anomalies in the southern hemisphere of the lunar far side. "We detected a strong flux of deflected solar wind protons. This clearly indicates that magnetic anomalies can shield the lunar surface from the incoming solar wind, in the same way as the magnetospheres of several planets in our solar system," says Dr. Futaana. "It all depends on how strong the solar wind 'blows'. When the solar wind pressure is low, this 'mini-magnetosphere' expands, causing stronger shielding," adds Dr. Wieser, also of the Swedish Institute of Space Physics. Spatial variation of the energetic neutral hydrogen flux over the magnetic anomaly close to the Gerasimovic crater. (a) High energy hydrogen flux with energy indicates a ~50% flux reduction inside the magnetic anomaly compared to the surrounding area. (b) Hydrogen flux with lower energy of 30-100 eV fills the magnetic anomaly. (c) The albedo (reflectivity) map of the Moon with the spacecraft trajectories (white lines). Truly a great piece of evidence that an electric current between the Moon and some other astral body, caused the crater and the magnetic anomaly which would then be remanent magnetism. Look how disparate the applied physics are between the reconnaisance of Jupiter is vs what they bring to bear on the data coming from our Moon... "magnetic anomalies". The only reason these scientists find the data anomalous is because they are refusing to admit what causes magnetism! If it had been the team doing the studies on Jupiter that had been investigating Luna, we'd already know the voltage and amperage of the circuits tying our planet and moon together! I think I'm going to start a petition with Change.org asking the U.S. government (for a starter) to hold scientists accountable for exhausting the knowledge of all known branches of physics before they are allowed to use the words 'surprised', 'shocked', 'anomalous', or 'dark' in any further press releases! It has been my understanding that lunar magnetic anomalies are called "mascons". Is this right? As far as I know, mascons have never been successfully explained. Orbiting Apollo craft were said to bob and weave noticeably closer to the surface when passing over these mascons. Are large deposits of heavy minerals below the surface causing mascons? Or are there vast hollows below the surface which cause the anomalies? Seismic tests have been reported in which the Moon rings like a bell for hours after a sizable impact, so perhaps there are indeed hollow regions beneath the surface of the Moon. A mascon is a mass concentration. It shows up on "gravity maps" made from measured changes in the orbit of a satellite, which responds to a greater or lower mass density on the body around which it is orbiting. Whether there is any connection between mascons and areas of greater (or lesser) magnetic field strength, I don't recall reading that such a connection has been observed or even inferred. It would indeed be interesting to find a greater magnetic value where a mascon is located, and to get enough evidence that such ties are common enough to be more than coincidence. It would also be interesting to excavate or drill for samples in the area of such coincidental effects to see if there is something different in the regolith or sub-surface composition that would tie the two together, such as, perhaps, a buried ferromagnetic (largely iron) meteorite remnant. The Moon shows many areas of excess subsurface mass (mascons) that cause the gravity field of the Moon to be very "lumpy," requiring constant adjustments for orbiting spacecraft. The mascons are always found beneath the floors of large impact basins and probably represent plugs of dense, uplifted rocks from the lunar mantle. * This http://www.science-frontiers.com/cat-astr.htm says "Alignment of Mascons and Lunar Moments of Inertia" is a problem, but doesn't say why. Mascons underlay most (but not all) maria. But it's dubious to say these are impact basins. All the maria are clustered on the Earth-side around the point closest to the Earth. If they are formed as a result of impact, it could only have been with the Earth itself, possibly in a close approach during a capture event. Librations bring the dynamical bulge out of alignment with Earth, which tries to pull it back against the moments of inertia. This results in additional wobbles. The suite of LCROSS and LRO instruments determined as much as 20 percent of the material kicked up by the LCROSS impact was volatiles, including methane, ammonia, hydrogen gas, carbon dioxide and carbon monoxide. The existence of mostly pure water ice could mean future human explorers won't have to devise complicated processes to retrieve water out of the soil in order to use it for valuable life support resources. In addition, an abundant presence of hydrogen gas, ammonia and methane could be exploited to produce fuel. Silver was mentioned. Elsewhere I've seen gold referred to. Whee! Luna here we come (again)! But it seems readily apparent that la Luna does harkin to a common genesis with ma Terran. Sorry - can't see this. I have predicted that dinosaur fossils will be found on the Moon and these results give me no reason to change that prediction. What do you reckon to be the genesis of our moon then ?